Here’s a simple activity if you’ve got a few extra minutes before lunch or during other transitions. Children will develop listening skills, auditory memory, as well as social skills. Directions: Have children sit in a circle. Explain that you will hum a tune. If they know the tune they can smile at you. When most of the class is smiling, say, “one, two, two, three tell.” All the children say the answer at the same time. Continue humming tunes as children try and identify the songs. *Let children take turns humming tunes as their classmates try to name that tune! You know, sometimes things just happen for a reason. Several weeks ago when I was driving home from North Carolina I heard about a documentary called “Alive Inside.” We have always known that music is stored in long term memory and that’s why it’s such a powerful learning tool. However, now they are finding they can reach deep inside people with dementia and tap into their feelings and memories. Dan Cohen made individualized iPods for patients loaded with music from their youth. The results were ASTOUNDING and you should do a search of “Alive Inside” and check it out for yourself. If you know anyone suffering from dementia, this could be a way to put a smile on their faces. I jokingly tell people in my workshops that I’m the one they are going to want to be next to in the “home” because I have so many songs and rhymes stored in my brain. Maybe this isn’t a joke after all!!! So, every day this week start and end your day with a song. Shut your door and sing every chance you get. You’ll not only be helping your students brains grow, you’ll be giving them a treasure that will be stored in their memories the rest of their lives!!! Lucky us to be able to touch a life in such a magical way! Here’s an idea that is a perfect application from Zull (Repeat! Repeat! Repeat!) and Biffle (Mirror!). 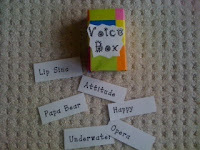 On a small box write “Voice Box.” On index cards write some of the different “voices” below. When you want to reread stories, say the alphabet, read the word wall, count to 100, and practice other skills, let children reach in the “voice box” and choose a voice. Three Bears – Read papa bear style (with a deep voice), mama bear style (with a prissy voice), and baby bear style ( with a wee voice). You can even do granny bear where you pull in your lips like you are toothless. Emotions – Read text with different emotions, such as happy, sad, angry, sleepy, etc. Underwater – Put your index finger between your lips and vibrate as you read. With a Cold – Children hold their nose and read as if they have a stuffed nose. Martian – Make antennae with index fingers over your head. “Beep” for the syllables in the words. Rainbow – Open hands and place on the left side of your body. Swing up and across the body in an arc as you read each line. Lip Sinc - Mouth the words. Pirate - Read out of the side of your mouth. Grrr, matie! Mouse – Read with a high, squeaky voice. Monster – Read with a deep, gruff voice. Turtle – Read very, very slowly. Robot – Extend arms and move them like a robot as you read like a robot. Scooby Doo (Ruff! Ruff! ), Mickey and Minnie and other characters children suggest. Attitude – Hands on hips and roll eyes. Opera – Stretch out arms and sing dramatically like an opera singer. Animals – Speak with animal voices such as cats, dogs, horses, sheep, etc. Hint! When counting to 100 choose a different voice for each set of ten. Challenge children to use as many words in their sentences as they are in age. Ask children to use as many colors in their drawings as they are in age. Z - e - r - o spells zero. O – n – e spells one. T –w –o spells two. T – w – o spells two. Three – It’s as easy as can be…. Give children flash cards of number words to hold up as you sing. 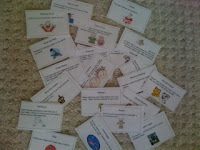 Reading through the notes teachers share at my workshops is like finding a prize in a box of Cracker Jacks! Look through this list and I guarantee you’ll find something to add a sparkle to your day! Ask parents to send in cereal boxes. Cut off the back and laminate. Place in a reading bin with dry erase markers and allow students to work the puzzles if they finish their work early. *You can also collect kids’ menus from restaurants and laminate. Write sight words on popsicle sticks. The children use wooden skewers to try and pick up sticks without moving any of the other sticks. Encourage them to read the word on the stick. *You could make a similar game with letters, math facts, etc. Cut out odd magazine pictures and glue them on cardstock and laminate. For the pre-k children pass out a pictures and let each child talk about their picture. It’s a great way for making inferences and encouraging complete sentences. *In kindergarten put several pictures in a basket and let children draw a picture and then write about it. At circle time tell them to put their baby fish in their fish bowl (hole created by sitting cross legged). To encourage children to practice cutting at home ask parents to fill a shoebox with junk mail and safety scissors. Keep the box on top of the refrigerator and bring it down when parents are busy cooking dinner. Glue plastic coins to the end of craft sticks. Write “bankrupt” on one stick. Place the sticks in a can with “Bank” or “ATM” written on it. Children sit in a circle and take turns passing the can and drawing sticks. Each time a student draws a stick they must name the coin and tell how much it’s worth or it goes back in the can. The game ends when someone draws the “bankrupt” stick and they have to give all their money back to the bank. Children add up the amounts on their sticks and compare who is the richest, poorest, etc. Buy little plastic slinkies at the dollar store and let the children use these to stretch out words. Then they all look the same. If your eyes are on me clap your hands. If your eyes are on me then it’s me that you see. Greetings are so important and many people use an apron with different types of greetings for kids to choose. An adaptation to this would be to make a wheel (like Wheel of Fortune) and use picture symbols to represent the different handshakes (biker, fisherman, butterfly, thumb kiss, Spiderman, hand hug, farmer, etc.) so children could spin the wheel. If you used Velcro you could change the greetings throughout the year. *You could also use a wheel and spinner for cheers, songs, etc. Children could make a license with their picture, date of birth, address, eye color, hair, address, etc. You will need cups, cotton balls, and tweezers for this activity. Draw snowmen on cups and write the numerals 1-10 on their tummies. Children use tweezers to pick up snowballs (cotton balls) because they are too cold. Can they place the correct number of snowballs in each cup? *You can also use the snowmen to sequence numerals, seriate by size, etc. *Make a similar “Pot of Gold” game with salsa black bowls and gold coins. Children can draw red, green, or yellow apples and can make different patterns with the apples. You can use a pumpkin, snowball, shamrock, or any seasonal shape to help children learn positional words. Attach a foam circle pumpkin with yarn to the front of a book and store in a pocket. On different pages have a seasonal picture and write “under the haystack,” “beside the moon,” “between the trees,” “above the fence,” “on the house,” “behind the cat,” etc. After reading HAVE YOU FILLED A BUCKET TODAY several times brainstorm ways to “fill buckets.” Purchase mini Chinese food boxes at a dollar store. Print each child’s name under a bucket that you’ve stapled to a bulletin board. Each time the teacher or a classmate catches a student being a “bucket filler” they get a pompom added to their bucket. This encourages positive behavior in everyone. Write numerals vertically down a paint paddle. When the teacher says, “Show me 4,” the children attach the clothespin to the numeral and hold up their answer. You can use paddles for addition, subtraction, and other math skills. *Make paddles with letters, shapes, etc. *Adapt throughout the year with a broken heart in February, cracked egg in April, melting snowman in January, etc. Put like stickers on the bottom of jumbo craft sticks. You will need as many sticks as there are students in your classroom. Take two cans and separate the sticks into the cans. Have higher level students (or English speakers) pull from one can and lower level students pull from the other can. Children will be randomly matched, but also in pairs where they can help each other. Over Christmas or spring break ask students to make an ABC book with advertisements, napkins, photos of products, restaurant logos, etc. Can they find something for each letter? *Count to ten while they find a new partner. I’ll show you what to do with those letters in a minute. Let’s go through the alphabet. Some hang those bottoms down. Break crayons in half and children will use three fingers. Golf pencils also encourage children to use three fingers. At the end of the year have an author and illustrator party using children’s individual books they’ve made in the classroom. It’s a way to celebrate writing throughout the year. Parents are invited to attend and cookies and drinks are served. Teachers are so generous to share ideas with me at my seminars. However, translating their notes isn’t always that easy as you can tell from the photo. These ideas are almost like seeds that you can take and grow into your own activities. As a teacher once remarked, “Teachers don’t steal ideas. They harvest ideas!” Help yourself to this garden of ideas! Place sight words inside Easter eggs and hide. Children have to write a sentence with the words they find in the eggs. This site has amazing text, pictures, and videos and is great for teaching science and informational text. Use it as a springboard for writing. You can sign up and get a booklet of free coupons for a personal pan pizza. No purchase required. Great for a monthly reading reward! Two children are selected to be “advisors” for the day. During guided reading/workstations students ask a partner or one of the “advisors” before sitting in the “waiting chair” to ask the teacher. “Ask three, then me!” They have to wait until the teacher can get to them and often leave because they figure it out while waiting. This really helps eliminate disruptions during guided reading! Take a mirror and put a hat/head on top and add arms and legs to create “Mr. Tuttles.” Children tell Mr. Tuttles their tattles! Fill Altoid boxes with plastic letters and use for small group work. Have children pour out their letters and then spell “rat” in the box. Tell them to close the lid so their neighbor can’t see. Share when everyone is done. But it wouldn’t let me be. I am ready for the hall! *A secret student is picked from craft sticks and the line leader and caboose watch the secret student in the hall. If that student is well behaved the class gets a tally mark. If the tally marks beat the teacher on Friday the class earns extra center time. This is a fun website and it’s free! Lots of games, cards the kids can make, etc. I’ll count hands instead of sheep. In (teacher’s name) first grade. The students use fabric paint to put their handprint and write their name on all their friends’ pillowcases. Use this idea from Vanilla Ice to get kids’ attention. Teacher says – All right, STOP! Children respond – Collaborate and listen! I can pick my friends. I can pick up my toys. I can pick my coat off the floor. But I won’t pick my nose no more. No I won’t. I say I won’t. No, I won’t pick my nose no more. And you’ll be so proud of me! Write letters, words, etc. on chart paper or board. Have 2 children come up at a time to race and find the letter the teacher calls out. Each child is given a fly swatter and the first one to “swat” it wins a point for their team. Have the class squat down as you begin they song. They get to “pop up” when the letter that their name begins with comes up in the song. This is great for beginning sounds and teaches the kids what letters their friends’ names begin with. If you have a mess of paper on the floor allow the children to become vacuum cleaners. They crawl or slide around on the floor making noises and picking up the trash. They will love it! When they have a problem they can use the tools and signs to work through the conflict. Use giant paint sticks for retelling stories. Put Velcro at the end of the sticks and then attach pictures. These could also be used as song visuals. Make donuts out of foam and decorate with markers. Write letters on each side of the donut. Next, put a vowel in the middle of a small paper plate. Children place the donut hole over the vowel and sound out the word. Put matching pompoms in a can and let each child draw a pompom. They match pompoms to find their buddy. Use travel soap containers to store crayons, magnetic letters, sight words, etc. Write endings (rimes) on the board. The students choose a beginning sound and place it in front of the ending. If it makes sense, write the word at the top of the board. If it does not make sense place it in a trash can on the bottom of the board. Use ice cream cone cut outs (available at the Dollar Tree) for this activity. Write “Who?” “What?” “Where?” “When?” “Why?” on the back of the cones. Hold these up in a fan shape so children can pick one and tell that part of the story. You can also write “verb,” “noun,” “adjective” on the ice cream cones. Children pick a page in the book and identify that part of speech in a sentence. You can use flannel back tablecloths for everything. They are sturdy and won’t slip on the carpet. Just have the kids take off their shoes. Keypad – If you draw a keypad children can jump their phone number, cafeteria number, or use for number recognition. Popcorn Words – Write words or letters on popcorn shapes. Children jump around identifying letters or words. Keyboard – Make a keyboard and use for letter recognition or spelling words. Graph – Draw out a bar graph and use or comparisons. My eyes are looking straight ahead. Hang the days of the week on a clothesline. Put two clothespins on the current day. You can also use the clothesline for letters, numbers, etc. Use this idea to keep students in line going down the hall. Put your finger on a wall, on a wall. After singing the “Itsy Bitsy Spider” let children change what kind of spider it is. It could be happy, mad, mean, angry, silly, pretty princess, etc. Then children decide how that spider would go up the waterspout. I think Chris and I could be good friends because we’re certainly on the same page when it comes to engaging children in a meaningful. I hope to attend one of his workshops and learn more! 1. The Attention Getter: Class-Yes! 2. The Organizer: Rehearse Classroom rules with gestures. put a point under the smiley. and stare intensely at the teacher. I think it’s interesting to reflect on the biological aspects of the brain from Zull’s research with the practical applications from Biffle. Have I bored you with all this brain research? Well, come back tomorrow and I’ll “switch” to more fun ideas for your classroom! Part I focuses on foundations for learning. An important concept was that “emotion seems to be the mortar that holds things together.” Good teachers have always realized that the only way to the head is through the heart! Part II gives specific suggestions about what teachers should do to produce physical change in the networks in the brain. Prior knowledge is key! Part III revisits the major parts of the cerebral cortex. The only way to get information in the brain is through the senses – seeing, hearing, touching, smelling, and tasting. The brain reflects on those concrete experiences and then must act on it. Watch for inherent networks (natural talents) and encourage their practice. Arrange for “firing together.” Associated things should happen together. Don’t stress mistakes. Don’t reinforce neuronal networks that aren’t useful. Try to understand existing networks and build on them. Nothing is new. Misconnected networks are most often just incomplete. Try to add to them. Be careful about resurrecting old networks; error dies hard. Construct metaphors and insist that your students build their own metaphors. Use analogies and similes, too. As I reflect on this book I realize once again that “good teaching is good teaching.” Thousands of years ago, hundreds of years ago, and in years to come teachers will look in children’s eyes and when they see that twinkle they will know that something special is going on in the brain! WHAT WILL I BE WHEN THEY RECYCLE ME?